Seventeen-year-old Lennie Walker, bookworm and band geek, plays second clarinet and spends her time tucked safely and happily in the shadow of her fiery older sister, Bailey. But when Bailey dies abruptly, Lennie is catapulted to center stage of her own life—and, despite her nonexistent history with boys, suddenly finds herself struggling to balance two. Toby was Bailey's boyfriend; his grief mirrors Lennie's own. Joe is the new boy in town, a transplant from Paris whose nearly magical grin is matched only by his musical talent. For Lennie, they're the sun and the moon; one boy takes her out of her sorrow, the other comforts her in it. But just like their celestial counterparts, they can't collide without the whole wide world exploding. I've read many books over the years where the main character was grieving over the loss of a loved one - parent, sibling, boyfriend, etc. The Sky Is Everywhere is without a doubt, the most eloquent, the most real depiction of grief I have ever encountered. Grief permeates every word of this novel. This makes the book very hard to read. I had to put it down several times, because I simply couldn't take the sadness. This is not a criticism of the book. Lennie's grief never comes across as overdone or melodramatic. It is real as real can be. And reality can be hard to take. Every character in this book is a developed, three-dimensional personality. I like every person in this book, despite the fact that their flaws are not hidden. Lennie is a wonderful protagonist. She is a thoughtful, quiet girl who doted on her sister Bailey. She sees herself as a companion pony to Bailey the racehorse. Without her racehorse, she is lost. Lennie is a talented musician and writer but fears achievement. Bailey and Lennie are raised by their Gram with help from Uncle Big. Their mother skipped out years ago. Gram and Uncle Big are wonderful, supportive caregivers, even if Gram is a bit out-there and Uncle Big is a womanizing pothead. 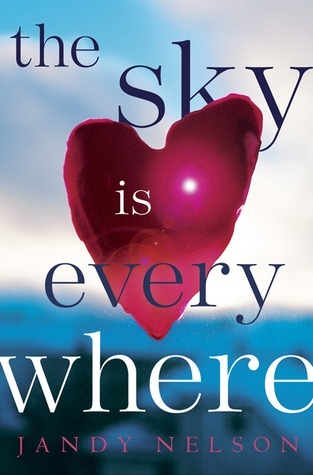 Landy Nelson creates a fabulous love interest in The Sky Is Everywhere. Joe Fontaine is the newcomer in town - from Paris. He meets Lennie in band and is quickly entranced. He is funny, charming, kind, and smart. He quickly becomes a presence not only in Lennie's life but in her entire family's. Lennie is head over heels for Joe. But standing in the way of their relationship is Toby, Bailey's boyfriend. Toby is the only person who seems to "get" Lennie's grief. Their grief is expressed in physical attraction to one another. This could be rather disturbing, but instead comes across as sad and relatable. But the biggest barrier to Lennie and Joe's relationship is really Bailey. Lennie never forgets that Bailey is gone. Lennie grieves that Bailey never met Joe and feels guilty that she is falling in love while her sister can never experience the same joy again. I love the use of poetry in The Sky Is Everywhere. Lennie writes poems describing her grief over Bailey and her love for Joe on random scraps of paper, cups, tree bark, and more. The start and end of many chapter feature Lennie's poems. If she wrote the poem on a cup, we see a cup rim. If it was in a journal, we see lined paper. The visual representations of the poems are a fabulous addition. Rating: 4.5 / 5 - Maybe a 5 / 5, as much as I like it, I can't entirely decide. Brilliant review! Ever since I first saw it, this book has interested me. I have no idea why I haven't picked it up yet. It sounds too gorgeous for words! I really want to read this one it sounds awesome. Thanks for the great review! The Sky is Everywhere sounds like a beautiful story & I love that cover! Fantastic review. Thanks for the recommendation. I've heard several good things about this book but am not too sure it is for me - maybes at a later date. Your review makes me want to search out the book. Thanks for such a heartfelt review. I loved this, too. A book everyone should read! I Loved, loved, loved this book. I hope it wins the Printz Award. It is very touching. Oh my, I loved this book too. I haven't heard anyone NOT praise it actually.